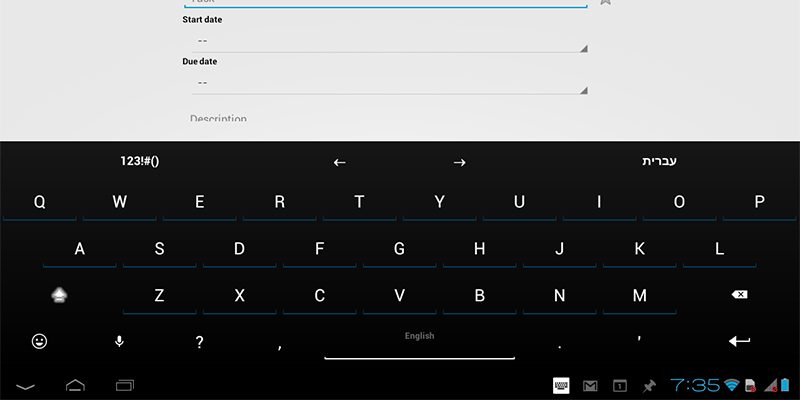 This is one of the most customizable keyboards available for Android devices. Multi languages keyboard support via external packages. Completion dictionaries for multiple languages. Completes your typed words from you contacts names (Android 2.0+). Learns your typing behavior to provide next-word prediction. Multi-Touch support (as in, pressing SHIFT along with other characters). Extension keyboard (swipe your finger all the way up out of the keyboard). Voice Input support (Android 2.2+). Theme support (comes with a few built-in skins). Build-in user dictionary words editor. Build-in abbreviations dictionary: create shortcuts for words and sentences. Clipboard actions copy, paste, select-all, select selectively (long-press select and use arrow keys).